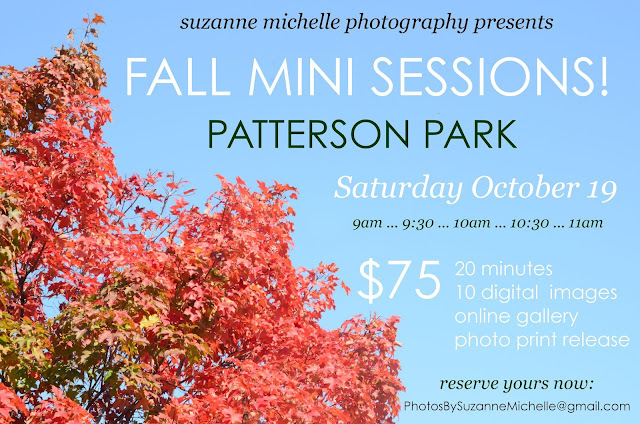 I'm really excited to be offering a morning of mini-sessions this fall!! If you just want a few shots for holiday cards, gift-giving, or mementos, this is the deal for you. And according to the ol' Farmers Almanac, this weekend will be the peak time for fall foliage displays. Last October, I may have driven my husband slightly nuts, stopping every few yards on our walk through Patterson Park to take pictures... But just look at those bright red leaves against the bluest of blue skies -- how could I resist?? *Payment is due upon booking, and the rain date is Sunday October 20th.